I know I said the inspiration for the serial sliced tooth came from the model bank, but in all reality I 3D printed the teeth first and then decided it would be cool to serial slice them. 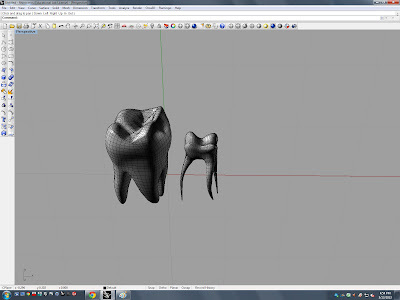 Once again here is the computer rendering of two different types of teeth. And here are pictures of both teeth 3D printed. I intend to make molds of both of these and trying to get casts of as many different types of materials as I can. I really want to take a cast in water so that I can freeze it and have it kind of resemble what happens if you don't take care of your teeth. Obviously the tooth melting over time would actually be the resemblance to the frozen tooth. Ill be working on these molds over the next few days to see how many casts I can get out of these.